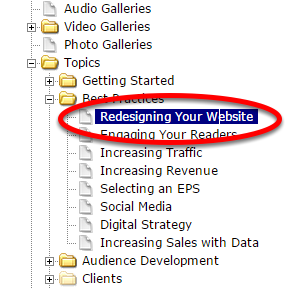 ePublishing Knowledge BaseePublishing Knowledge BaseePublishing Knowledge Base AdvancedHow do I remove taxonomies that won't stay deleted? For a variety of reasons, the taxonomies that you won't be using need to stay put. BUT you can HIDE or set these as UNSELECTABLE so that they are essentially invisible to any users. This article outlines the two methods you can use to either hide or set a taxonomy as unselectable. 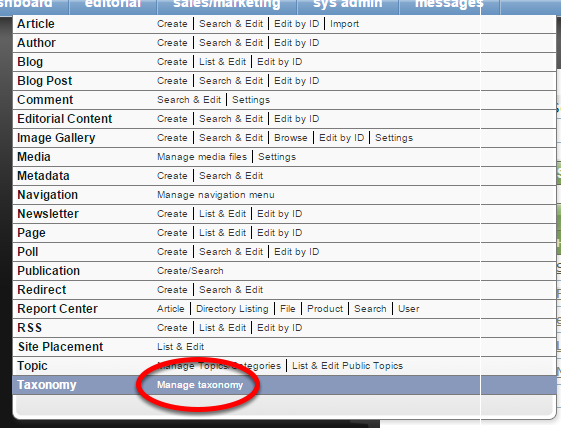 Open the Taxonomy Manager under Editorial on your dashboard. Select the taxonomy you'd like to hide. 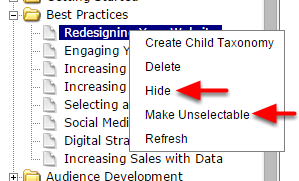 Right-click on the term and select either Hide or Make Unselectable. After opening the Taxonomy Manager, select the taxonomy you'd like to change. Click the Hide button on the right, and wait for the selection to automatically save. OR to make it unselectable, click the checkbox next to Selectable so that a checkmark no longer appears. Prev: How do I use the form mailer? Next: How do the automatic related widgets on my site work?